INNside Track – Page 2 – A pub for every rail station in Greater London! London Victoria has always been very familiar to me – it was the start of the journey home to Brighton from trips to London when I was growing up. It marks the start of the second part of my National Rail trail, kicking off my journey to all the Southern rail stops in Greater London. With over 81million passenger journeys here in 2015/16, Victoria is the second busiest station in the entire country, topped only by Waterloo. It began life as two separate stations, operated by different companies. 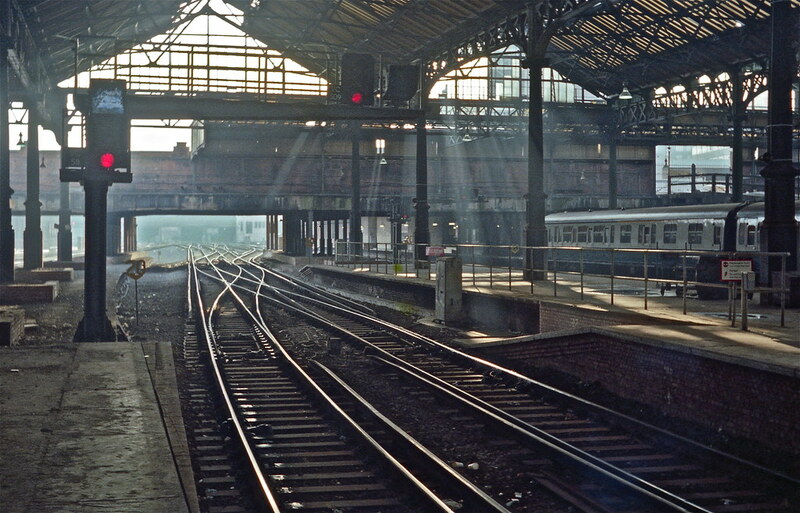 The Sussex side, platforms 9 to 19, opened first in 1860, with the Kent side, platforms 1-8, following two years later. There was no way to pass between the two sides internally until the 1920s. The wall between the two sides was only fully removed in the 1980s. There are only three certainties in life, death, taxes and building works by Victoria Station. Visiting the tube station here in April 2013, I commented it had been a building site for as long as I could remember -four years later, little has changed. The tube station upgrade is due to be completed next year, but I’m sure there will be another project around the corner. There are lots of mediocre tourist trap pubs on Victoria Street, so we took a side street to visit the Cask and Glass. It’s a few minutes walk from the station, just behind the Cardinal Place complex on the junction of Palace Street and Wilfred Street.Inside, it’s a cosy little one room pub, with a few tables outside at the front too. It was pretty quiet on our Monday evening visit so we were able to get a seat, but I’ve walked past on occasion and its looked rammed. It’s a Shepherd Neame pub, so commuters back to Kent can enjoy some of their local beers before making the journey home. It had four of their ales on tap – Spitfire, Hog Island, Master Brew and Whitstable Bay. They only do food at lunchtimes between 12-3, offering a selection of toasties for around £4 a pop. With its primary trade coming from office workers, The Cask and Glass is shut on Sundays and closes at 8pm on Saturday. With its carpet, curtains and leather backed seats, it has the vibe of a village pub a stones throw away from the chaos of Victoria Street. Given its proximity to both Buckingham Palace and Westminster, it’s also no surprise to see pictures of Queen Victoria on the walls as well as the odd political caricature. There is one of Barry Porter, an MP from 1979-1996 and who I’d never heard of before. I have no idea how he gained the accolade of being displayed on the wall here. His Wikipedia entry is pretty sparse and the cartoon in this pub listed in the ‘legacy’ section! I enjoyed visiting to The Cask and Glass. It’s nice to find a homely spot in an area that is otherwise represented by uninspired tourist fare. If you’re looking for a good spot for a drink near Victoria Station, this is definitely worth checking out. Now I’ve finished off all the South West Trains stations in Greater London, I thought it was a good time for a quick look back at my highs and lows along the way There were 40 stations in total, starting at Waterloo – the busiest rail station in the entire UK – and ending in Worcester Park. In truth, it was a good route to start off with because the vast bulk of the places I visited were decent and I was really impressed by the caliber of pubs in these parts. I kept expecting to come across more duds but in truth I can count the ones to avoid on one hand. In terms of particular highlights, I’ll pick out a few here. The Mitre in North Sheen was a great find. It was hidden down a quiet residential street, had twelve ales on tap and a friendly pub dog called Rudi! The Express Tavern by Kew Bridge was also excellent; it had real character and another extensive ale selection. The Sussex Arms in Strawberry Hill stood out for me for similar reasons, it was buzzing on our visit and had a dozen ales on tap. Other top spots along the way included The Vauxhall Griffin(no prizes for guessing where), The Ailsa Tavern in St.Margarets and Woodies Freehouse in Malden Manor. Perhaps it should have been no surprise I found so many good places – this part of town has a strong pub history behind it. Youngs brewery was based in Wandsworth until 2006 while Fullers Brewery is still going strong in Chiswick today; both were well represented in these opening stages of the blog. Fullers even provided me with a decent pub in Hounslow in The Cross Lances, a big improvement on what I endured for the three tube stops there. Thankfully there were only a couple of pubs I’d give a ‘steer clear’ warning on. The Broadway Bar in Tolworth was the worst – as I said at the time, it had all the character of an airport lounge. I also didn’t enjoy The Red Lion in Isleworth partly stemming from its Marie Celeste atmosphere and the fact the bar was deserted when we first arrived. Another Red Lion, this time in Feltham was also a bit forlorn, but at least it had a manager trying to pick the place up. All in all, the lucky folk of South West London have plenty of excellent pubs at their disposal. I thoroughly enjoyed my travels through that neck of the woods – now it’s time to shift eastwards and head on over to Victoria, kicking off my travels on Southern Rail. Worcester Park is my final stop on the South West Trains leg of the blog. It first opened on 4 April 1859 and was initially called Old Malden, it gained its present name a mere three years later. The next station heading south on the line is Stoneleigh, which is within the borough of Epsom and Ewell. The ticket office building here is a simple brick design which looks very ’30s – the station was redeveloped around this time in response to housing growth in the local area. 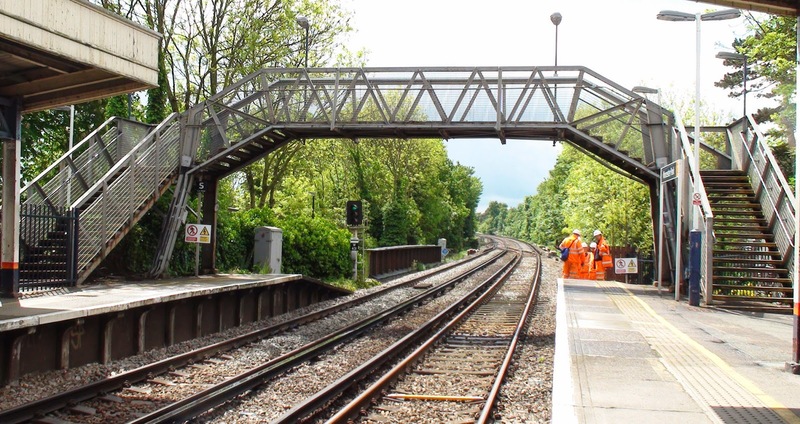 More recent additions at the station include the installation of a new footbridge and lifts in 2014, replacing this metallic structure. Worcester Park was originally omitted from the proposed route of Crossrail 2 – after people power intervened the plans were modified and services are now planned to stop here, providing the project gets the green light. The pub is a brisk ten minute walk south from the station down the main shopping street in Worcester Park. Like the William Bourne a few stops ago, the North End Tavern is a Stonegate pub, complete with its range of discount themed meal deals. It had three ales on tap on our visit, Doombar, Youngs Bitter and Ghost Ship. The beer here was surprisingly cheap, two Doombars came to £5.80, which is cheaper than many ‘Spoons these days! The North End Tavern is a large pub and was fairly busy when we arrived but we were able to get a table. They have a TV sports licence and had the football on a big projector. By the time of the 4pm kick-off, the pub was rammed which is why I didn’t take any more photos inside as all I would have captured would be a sea of people! They also have a sizeable back garden, this was nearly empty on our visit, although given it was a cold Sunday afternoon, it wasn’t that surprising. The decor here is fairly generic, however there were a couple of nice local touches I liked here. On one wall there was an old black and white photo of people waiting at a paced Worcester Park station, another had one of the Railway Clearing House – the umbrella body set up to manage the allocation of ticket fares for journeys across multiple companies – diagrams of lines which existed in the pre-nationalisation period of the railways. As well as having a quiz every Sunday, there is also ‘Disco Fridays’, where a DJ plays 80s and 90s music from 8pm till midnight. The North End Tavern was a solid way to bring a close my run on South West Trains with its cheap ales and friendly atmosphere. If you find yourself in Worcester Park, it’s a sound place for a pint. Chessington South brings to a close my short journey on the Chessington branch line – it is also my second to last station on South West Trains – that all went quickly! The station opened in May 1939, again designed by James Robb Scott, like the other three stops on the branch. However in this instance you take steps down to the platforms, rather than up as is the case with the other stops. Chessington South was never intended to be the terminus of the line, the original intention was it to continue on to Leatherhead. Construction halted with the start of the Second World War and the project was never completed. There is a second platform here, complete with art deco curved shelter, intended for trains returning from Leatherhead. As a result, this has never been used by passengers and the station now operates with just one active platform. Chessington South is the stop you’re after if you want the World Of Adventures. The only pub in the vicinity is just past the theme park. It’s a fair walk, over 15 minutes from the station south down Leatherhead Road. Having read the only pub round here was a Beefeater based right by a theme park, my hopes weren’t high. These feelings were only heightened when I realised it was connected to the theme park’s Premier Inn. Online it is listed as being called ‘Monkey Puzzle’ but the only branding I could see outside simply said Beefeater. Inside it’s spacious pub a feeling reinforced by the very high ceiling in its main area. As you might expect, the decor is fairly neutral with the unpainted brick walls decorated with prints of plants and flowers. The exposed piping(ventilation I assume?) gives it a bit of a warehouse look. It also has some outside seating, backing onto Leatherhead Road. To its credit, there were two ales on tap, London Pride and Hobgoblin. The food isn’t as cheap as I thought it would be, it was £11.99 for a Cheese and Bacon Burger and £12,29 for Fish and Chips. That’s what comes from being attached to both a theme park and a Premier Inn, neither of which are known for cheap food. Having expected the worse, we actually found it wasn’t too bad in here. My worst fears were a soulless pub filled with a mixture of overtired and hyper kids after a day at Chessingtons. In reality, it was more chilled and less manic than that. There was a family sat near us celebrating an 80th birthday, although that did have me wondering who would come here who hadn’t been to the theme park. I guess that illustrates how few options there are round here. Chessington North is my penultimate stop on the Chessington branch line. It opened on 28 May 1939 as the route was extended from Tolworth to Chessington South. The station design is very similar, if not identical to the preceding two stations on the branch. Although I have to say I think the curve of the platform shelters is slightly less pronounced here than it was at either Tolworth or Malden Manor. The pub is just over 10 minutes walk from the station, heading straight along the main road south. The William Bourne is located near the slightly ominous sounding Bonesgate Open Space which gave the pub its former name. The William Bourne is a Stonesgate pub, the branding of which is similar to a Wetherspoons and it does have the feel of one. The food is certainly in the ‘spoons pricing range too, with a burger and a drink for £6.25 as well as a two meals for £9.99 offer too, covering options like fish and chips and lasagne. Again, like a ‘spoons, there are different ‘nights’ during the week with themed food discounted, these run every day except Sundays. On Wednesdays for example its ‘Cantina Mexicana’. where you can get a ‘Latin American’ dish(mainly burritos really) and a drink for £5.99. They had three ales on tap on our visit, Deuchars, Doombar and Tribute, so some solid options there. They have a sports licence – something you wouldn’t get in a Spoons – and the front of the pub was really busy with people watching the 4pm game on Sky Sports. The back area was slightly quieter with families having a Sunday meal out. They also have both a back garden and a small seated area outside the front of the pub. The decor here is fairly generic and inoffensive as you might expect, plus some old photos of the local area on the wall too. The pub has various events on during the week, including ladies’ darts on a Monday mens pool on a Tuesday and a quiz on Thursdays. I thought only pubs in soap operas had ladies darts nights – a common occurrence in Eastenders back in the day. The pub is actually incredibly close to the border of Greater London, walk a minute further south down Moor Lane and you’re in Epsom and Ewell. The William Bourne is an alright spot for a drink. It’s nothing special really, as you might expect from a chain, but it would do the job if you were in the area. They look less curved to me..